She wanted to hold foreign syllables like mints on her tongue until they dissolved into fluency. Perhaps our deepest love is already inscribed within us, so its object doesn't create a new word but instead allows us to read the one written. 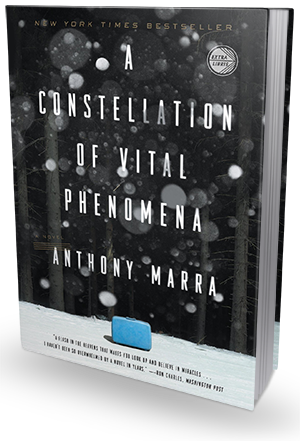 A Constellation Of Vital Phenomena is a remarkable debut novel. The story takes place is Czechnya during the second Czechen war, and it follows a group of people, including an 8-year-old girl who just became an orphan, a young woman-surgeon desperate to find her missing sister, and a man with a dying wife who paints pictures of 41 murdered neighbors and hangs them around his ruined village. Three souls that have nothing in common and yet their fates intertwine with one another in ways they could never have imagined. Havaa's house has been burned down, her father taken away by the Feds, never to return again. She is only eight, has no place to go, no one to take care of her. One blue suitcase filled with "souvenirs" is all she has left. She is so vulnerable, so breakable, so pure and naive, and confused by the cruelty of the world surrounding her. She's just a little girl, and no little girl should ever have to go through the things Havaa went through, see the things Havaa saw, and feel the pain Havaa felt. It's heartbreaking to even think about it. And even more heartbreaking when you realize there are thousands of children out there whose faiths are equally or more tragic. Sonja's a surgeon - the only surgeon in Volchansk. Ever since her sister, Natasha, disappeared, Sonja's life revolves around the trauma ward. She doesn't even go home to sleep anymore, the hospital is her home now. She's burned out, bitter and addicted to amphetamine. ("She lived on amphetamine and sweetened condensed milk, had regular hallucinations, had difficulty empathizing with her patients, and had seen enough cases of secondary traumatic stress disorder to recognize herself among them.") Akhmed describes her as "cold, domineering woman, whose glare could wither flowers and cause miscarriages." Akhmed is the one who finds Havaa in the woods after her father is taken away. He can't take care of the girl himself, and so he makes the decision to take her to the hospital and ask Sonja to take her in. Sonja, of course, isn't very eager to add yet another burden to her already overwhelmingly messy life, but in exchange for Akhmed's help at the hospital, she agrees to let her stay there temporarily. The writing is beautiful. Achingly beautiful. Vivid, saturated, evocative, illuminating, powerful. I can see myself re-reading this novel just to experience the flavorful writing style again. Juxtaposed with the brutal, depressing, thoroughly disturbing reality of war-immersed Chechnya, the narration style seems as light, fragile and gentle as butterfly's wings. And the contrasting combination of the two really enhances the reading experience. I was charmed and disturbed, mesmerized and scared all at the same time. The historical backdrop is rich and accurate. The book covers the decade of two Chechen wars, exploring different timelines through flashbacks and recollections of events from the characters' past. When asked why he chose this particular period of history as the backdrop of his novel, Marra said: "Czechnya is a corner of the world largely mysterious to most Americans, yet it's a remarkable place populated with remarkable people who have become accustomed to repeatedly rebuilding their lives. To quote Tobias Wolff, "We are made to persist... That's how we find outthink we are." These characters commit acts of courage, betrayal, and forgiveness as they persist in saving what means most to them - be it their families, their honor, or themselves - from the destruction of war." Even the title of this book carries a meaning. It comes from a description of life in a medical book. According to that description life is a constellation of vital phenomena - organization, irritability, movement, reproduction and adaptation. Six phenomena that structure our lives. Havaa, Akhmed and Sonja might not be real people, but they're very far from being purely fictional characters either. What they represent and stand for, what they witness and experience, their pain, suffering, hopes and dreams - all these things are very real. These people stole my heart and became extended family. I got attached to them very fast and will be thinking about them for a very long time. A Constellation of Vital Phenomena is a book not to be missed. A true literary triumph in both the form and substance. I am thrilled to have discovered it and to have the opportunity to read it. It was definitely a life-enriching experience.